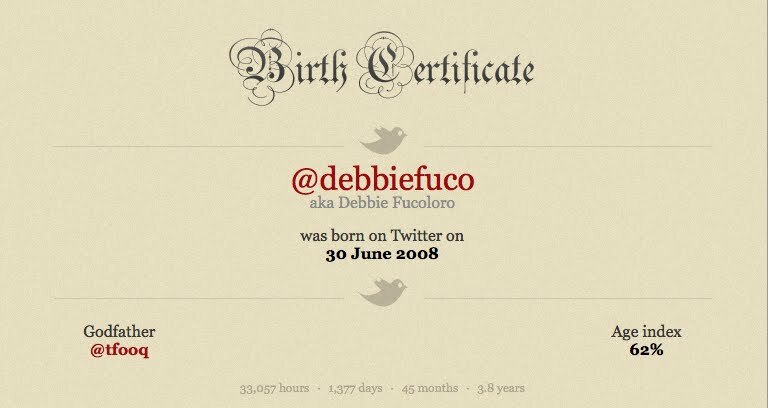 Jeff Thomas recently wrote a post call Twitter Birthday Birth Certificate. I wish the birth certificate was downloadable, but I took Jeff's advice and made a screenprint of the certificate. Then, I used SumoPaint and quickly edited the screenprint. Viola! 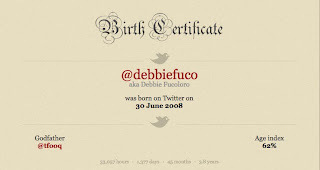 As you can see, the personalized birth certificate not only includes your Twitter birth date, it also includes your 'born on' facts, such as hours, days, months, and years since you joined and the name of your 'Godfather.' My Godfather happens to be my son. I don't know how Twitter knew Tom introduced me to Twitter, but they are correct! I've been on Twitter 3 years and 8 months. How long have you been on Twitter?